Home / Blog / Zero carbon farm? This year Cultivate has taken the first step in a bigger process to measure the greenhouse gas emissions from the business, starting with the farm. We collaborated with the Farm Carbon Cutting Toolkit to use their Farm Carbon Calculator, which takes into account multiple different factors to give an overall picture of greenhouse gas emissions from a growing site. Every methodology for calculating emissions is different, including or excluding different elements of the farm system and the inputs to it. So our figure isn’t directly comparable with other farms – but what it does do is help us identify where our greatest impacts are and where there is potential for sequestration across the site. Our production techniques are labour-intensive rather than using a lot of machinery. All we have for help is a two-wheeled tractor fed with the occasional guzzle of petrol (and a few hours of contractor time). We don’t use artificial pesticides or inorganic fertilisers, one of the main sources of emissions in conventional farming. We don’t have any electric lighting or power on site. Boiling tea-water on the gas stove is responsible for 0.36% of our total emissions, but this is considered absolutely essential for worker welfare! Carbon embodied in constructions and infrastructure is low – our only structures are the four polytunnels and a packing shed made of straw bales and tarpaulin. All energy for heating propagation units (off-site) is on a renewable tariff. By far the largest emissions source is transport to and from the site, which at 20 miles return journey 4 or 5 days a week is responsible for 60% of total emissions. Coming in at 15% is tractor diesel use by contractors – which although infrequent is an energy intensive operation. Farm practices including the use of bought-in substrate for plant-raising, compost use and soil management collectively emit just under 9% of the total. A total of just under 2% of emissions is embedded in materials used in the plastic coverings and metal frames of the polytunnels, water systems, and farm implements. 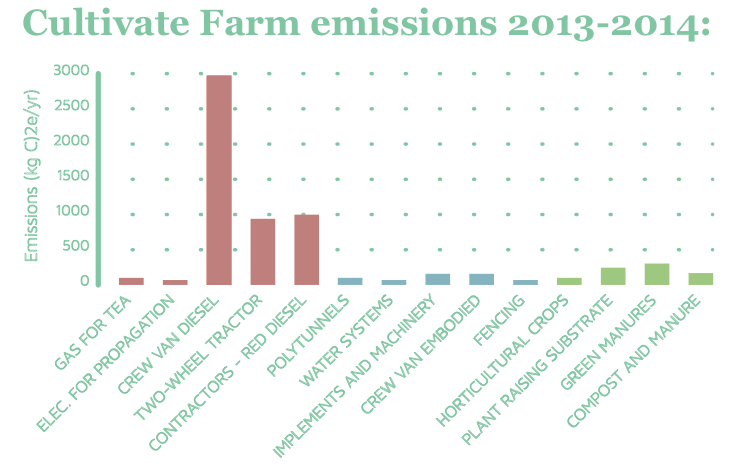 The total farm emissions come to around 6,000kg of CO2 equivalent each year. At the same time, Cultivate’s site is responsible for sequestering between 700 and 1,500 kg of CO2 equivalent every year, though likely towards the bottom end of this figure. 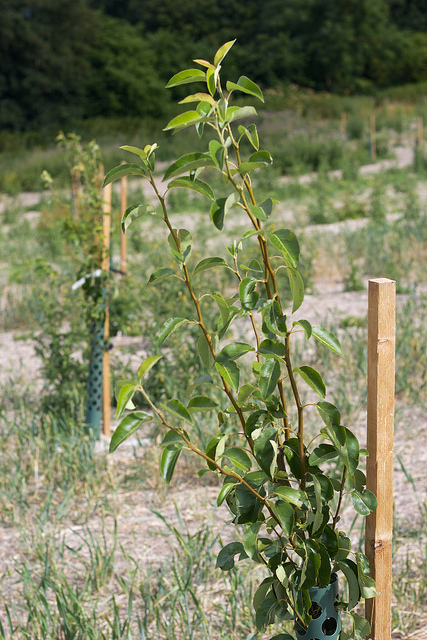 The variation is due to the fact that the calculator only allows us to input acreage of mature orchard, while our orchard is only a few years old. So come back in 10 years and we should be sequestering more! Our hedgerows and uncultivated field margins are responsible for the bulk of the current sequestration potential. Main emissions source: While all of our staff live in Oxford regular van trips to the site are inevitable, so our main GHG source is hard to reduce significantly. Training our drivers in efficient driving techniques could save up to 10% of fuel cost and emissions, and we should consider buying a more efficient diesel or electric vehicle when the current crew van needs replacing. Soil organic matter: This analysis of our farm site didn’t include any measurement of carbon sequestration in soils – we will look into having this tested. When we inherited the site, soils had been degraded by years of conventional arable farming. As we continue to follow organic management practices, soil organic matter and sequestration potential should continue to grow. 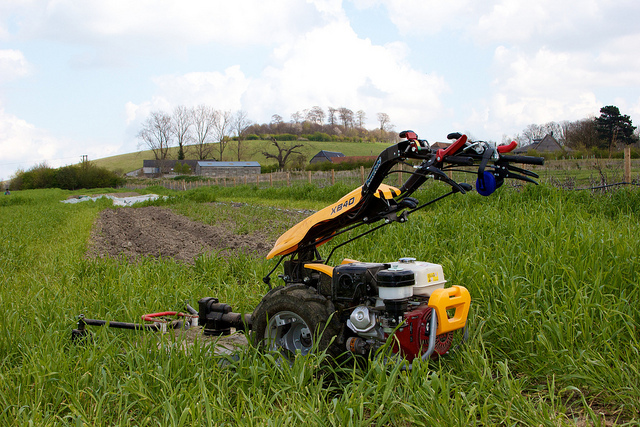 As a starting point, we will monitor the soil organic matter, to steer us in the right direction. Look after capital items: The impact of capital items is spread over the number of years of their lifetime, so extending the lifetime of polytunnels, machinery, fencing and other infrastructure with care and good maintenance will reduce their overall impact. Footprint the retail operation: This cradle-to-gate analysis takes us only as far as the impact of our veggies when they get harvested from the ground and brought back for storage in Oxford. The next stage will be to assess the impact of our warehouse, refrigeration and the VegVan. Watch this space! This piece was first published in our 2013 Annual Report. If we get our act together we may take samples for soil organic matter testing at the next Volunteer Day on July 19th – get in touch if you’re interested in helping out.